Love and Grace – The Enemies of Religion and Abuse! 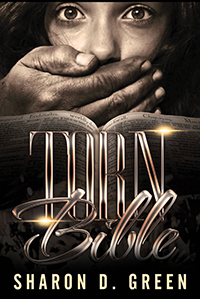 Torn Bible is a brutally honest and thought provoking memoir of perseverance, resilience, and redemption. 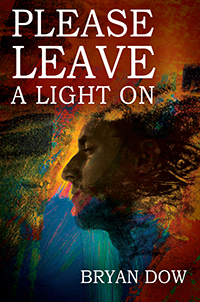 It is a look into a life plagued by sexual, domestic, church abuse, and mental illness. 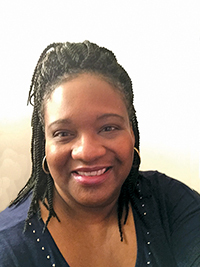 Sharon takes you on a very personal journey into her pursuit of love and acceptance. Her life takes many twists and turns through fear, trauma, and the fog of religion and legalism in her quest to know Jesus and His love for her. It is a story permeated by the love and loyalty of one family, while chasing love and acceptance from another. It is a story of a transformed heart and a developing personal relationship with Jesus Christ. Sharon brilliantly tells her story, with humility and boldness. Torn Bible is truly riveting and astonishing. Veronica Temai Marme is a Journalist by profession. 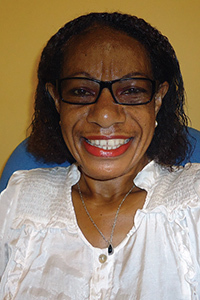 Ms Marme graduated from the University of Papua New Guinea with a Bachelor of Arts in Journalism Degree in 1994. Thus, for the past 22 years she had practiced the various fields of Journalism with the government of PNG as a Press Officer, Researcher, Press Secretary and Journalist to career politicians and Prime Ministers like Sir Julius Chan and Paias Wingti, Post-Courier as a Sub-Editor and Wantok Radio Light the PNG Christian Broadcasting Network as a pioneer News Editor, senior Journalist and a spiritual counsellor and mentor to the young girls, broadcasters. Currently, she is a senior Producer & Presenter with the NBC TV Programs section producing and presenting church and positive development programs. She is now a widow and is happily living with her three sons namely; Bobby Umba, Willie Umba and Charles Okuk Umba. 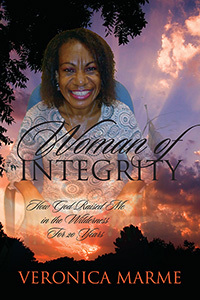 This book is an account of how God raised the Author in the wilderness for 20 years. “Before I formed you in the womb I knew you, before you were born I sanctified you, I ordained you a prophet to the nations.” (Jeremiah 1:5 Holy Bible, The New King James Version, pg 506). As the Author realised after 20 years when she started writing about her own life story that God had called her to be a prophetess to her nation, Papua New Guinea. The Author was adopted into the Marme family who raised her with so much love and care. She was brought up in a village called Hoblesuhul meaning ‘stone place’ (in the Goling vernacular) in the remotest parts of Simbu called Gumine in the Highlands of Papua New Guinea. She moved around with her adopted parents during the colonial days as her father Peter Marme was a ‘Mangi Master’ (domestic servant) with her illiterate mum Elizabeth Balua from Simbu to Port Moresby to Madang and back home, Gumine in the late 60’s and early 1970’s. Eventually, in 1984 she was fostered by a British woman who is an Anthropologist and an Oxford scholar who raised her in Brisbane, Queensland Australia for three years doing her grades 9, 10 and 11 in 1984, 1985 and 1986 respectively. And, that’s where the Author actually completed her secondary schooling at the Gap State High School in Brisbane successfully and achieved her Queensland Junior School Certificate in 1985. Her English woman guardian is normally known as Dr Joan Johnstone Drikore. She was one of the Professors at the University of Queensland with the Anthropology Department at the time the Author was fostered by her. After Brisbane she came back home and attended the University of Papua New Guinea where she met her husband and children’s father Robert Umba who just returned from attending People’s Friendship University in Moscow, USSR of Russia for his summer holiday on the 8th of July, 1988. She met Robert during her first year at the University of Papua New Guinea and started family while still being a student becoming a teenage mother and wife, and all the troubles and challenges she had gone through in life at that stage. And, she spent 20 years of her young vibrant life with Robert raising her family and she had faced a lot of situations and challenges in her life. However, despite all these her dreams of getting a University degree, becoming a Journalist and Author one day never shattered. She made it through and believes any teenager in her situation can make it like herself as she shares her life’s experiences and testimonies in this powerfully written book which is her autobiography. Robert D. Easton is a native of the state of Washington. He earned two liberal arts degrees from Central Washington State College at Ellensburg, Washington and has done postgraduate work at colleges in California. Even though classified as a veteran of the Korean War, he served only in Europe and in Stateside army posts as a teletype operator and message center clerk for the U.S. Army Signal Corps during 1953 and 1954. 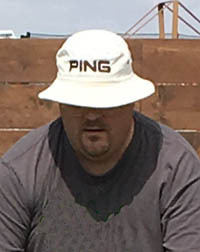 At various periods in his life, he has worked as a custodian, section hand, truck driver, newspaper reporter, schoolteacher, technical writer, landscape technician, parks maintenance worker, nurseryman, salesman, public school classified employee, warehouseman, and computer assembler. His latest employment is serving as foster grandparent in an elementary school in Sacramento California. His article, about Jack London, placed 22nd (out of 100) in the 1974 Writer’s Digest Article Contest. 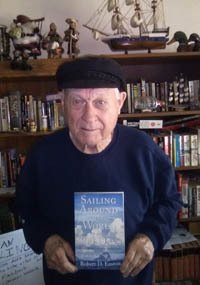 He has written nonfiction articles for Air California, National Humane Review, Horse and Rider, Sacramento Magazine, and Good Old Days magazines. The Hibiscus Press (In A Nutshell) of Sacramento, California, has published four of his short stories. In May, 1978, he published a book of nostalgia entitled Tales from the Palouse Country and in 2004, a memoir entitled Beyond the Palouse. In 2009, he wrote a paperback entitled, Cobwebs, Echoes, and Footprints. He lives in Sacramento and has four grown children and six grandchildren. 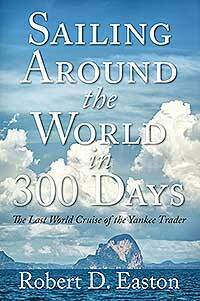 This book is a narration, written by the author, about a 31,000 nautical mile circumnavigation of the globe by the ship, Yankee Trader. In the early days of February 1979, Easton embarked on this voyage joined by approximately 75 other passengers, plus about 20 crew members. During this 300-day adventure, the Trader visited 61 ports and sailed the Atlantic, Pacific, and Indian oceans as well as the Caribbean sea. Yankee Trader, on this, its last trip, also crossed the Equator four times, the International dateline, and the Greenwich meridian once each. This was largely an island hopping voyage, enjoyed by many in the group who were engaged in the exploration, fishing, scuba and skin diving, meeting Islanders, savoring other cultures, and sailing into many beautiful sunsets. A consumer of mental health services for twenty-five years Bryan Dow was born in western NY, raised and lived in southeastern WI for close to forty years and now resides outside of El Paso, TX with his wife and two dogs. Bryan also enjoys writing outdoor action adventure and sci-fi stories. A Turbulent Journey Through Mental Illness. Stricken with a mental illness at the common stage in life where dreams and career possibilities surface, this book is about a young to middle-aged man named Bryan who faced rejection in a handful of career paths ultimately feeling pressured from within to become his own boss. Furthermore, this book takes the reader on a voyage of earning academic success, witnessing the ups and downs of those close to him as well as the healthcare bureaucracy, and experimenting with love though sometimes shallow. In retrospect Bryan concluded that, besides earning two degrees after his diagnosis, his work or informal training under a Vietnam veteran for just over six seasons at a public golf course had the most profound effect on him discovering manhood. Sacrifices were made. Friends and family were both negatively affected by this maddening illness that first exploded in Washington D.C. Bryan’s marriage is very symbiotic, but it never would have worked without his wife’s toughness learned and experienced while serving in the military for ten years. She demonstrates great skill in dealing with the adversity in their marriage. 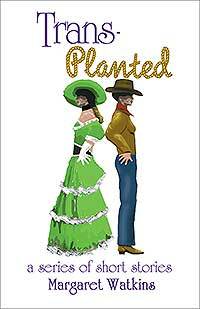 Margaret Watkins is a transplanted Southerner. By that she means a sweet southern belle who has maintained her roots firmly planted in Mississippi red clay while losing her heart to the sagebrush plains of Idaho. 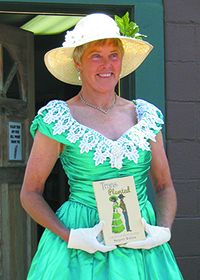 Margaret Watkins grew up on a small cotton farm in far northeast Mississippi. When she and her husband moved to a dilapidated ranch in the Sawtooth Mountains of central Idaho, the transition from belle to cowgirl had many bumps along the way. There is humor and tragedy, drama and hubris in these pages. Adaptation! That is the way to flourish after being transplanted. 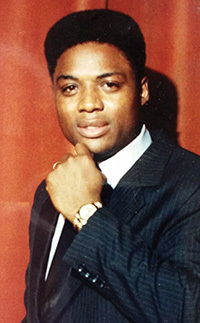 Robert P. Jones is a 6th generation Florida native. Jones’ 8th Great Grandfather was Onesimus Futch, who fought in the American Revolution. 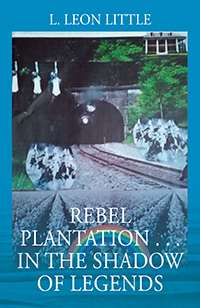 He was with Colonels Richard Caswell and John Lillington on February 27, 1776, when about a thousand members of the Patriot Army defeated an army of Scottish Highlanders at the Widow Moore’s Creek Bridge near the port city of Wilmington. Jones’ uncle, SSgt Phillip Lester Brinson, was killed in action during WWII on his tenth mission while serving as a tail gunner of a B-26. 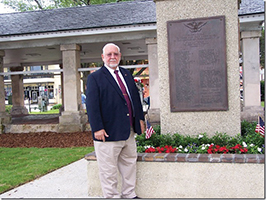 His name is on the monument in the St. Augustine Plaza. Jones married his high school sweetheart on May 28, 1955. He and Malinda had five children (Mike deceased 2014), seventeen grandchildren and seven great-grandchildren. Jones has worked for the commercial fishing industry as Executive Director of Southeastern Fisheries Association for fifty-four years. The story of the Minorcans in America is well chronicled. Minorcans (Menorcans) and St. Augustine, Florida are both unique. Spain had the first permanent settlement in America (St. Augustine). By the time Jamestown was founded by the English, St. Augustine was an established town. These short stories reflect a life well-lived because of the unconditional love of a Minorcan: my wife, Malinda Usina Jones. 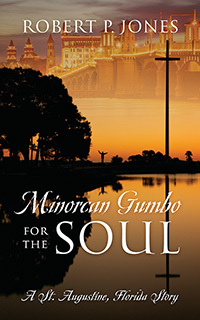 The stories are true and might make you feel almost as good as tasting true Minorcan gumbo with a drop or two of datil pepper sauce in the bowl. It has taken us from slavery to freedom, yet we are still secretly used for gain in a clever scheme of repression whose darkness is finding light, through the blood spill of our martyrs who’s sacrificed so much, including the ultimate. America still has so much work to do and so many have gotten too comfortable with the attitude becoming more like “if it doesn’t hurt or affect me, I’m fine.” We can’t stop our fight for freedom. So many of us have been pacified momentarily, you don’t know where the crooked officer is going to strike next because the loose cannon has no accurate target. As I look around and ask, how could this happen to me or why me, I am reminded of all the heroes who gave but never enjoyed the harvest of their labor. All the legends who paved the way and secured the freedoms we enjoy today surely turn in their tombs as another corrupt official takes the dream of the humble, an official with his hand so deep off into the public trusts that his elbow and arm have tendonitis from the frequency of activity. All the martyrs who were hung from the tree as the world watched and looked for guidance on a planet in a country, who is building a platform, on a mission out into the great unknown they cheer our efforts and guide our movements.